This entry was posted on 18/02/2017, in Editorials, Science and Technology, Transport and tagged City Planning, parking. Bookmark the permalink. Parking has become a serious problem in Colombo, but it is not the only metropolis to suffer this fate. Parking is a hit and miss affair in main cities such as Kandy, Galle, Nuwara Eliya (especially during the April season) and suburbs such as Nugegoda, Maharagama, Wattala and Kadawatha. Parking is a crucial aspect of city planning. If properly implemented, it is also a money spinner for local bodies. Most motorists do not mind paying even Rs.50 per hour if they can find a convenient parking spot. Having realised the importance of allocating adequate parking slots in the City, the Colombo Municipal Council (CMC) wisely included parking bays in the Galle Road Uniflow expansion project and also carved out many parking slots from byroads and lanes. While some of the parking slots can be manned by CMC or private parking company personnel, there is not enough manpower to supervise all parking bays in Colombo. Most countries implement an ideal solution for this – parking meters. The advantage of coming late to the parking meter party is that the CMC could leapfrog several generations of manual parking meters and select an all-electronic solution powered by a smartphone app. Basically, if you have a smartphone and a mobile phone account, you can pay your parking fees without any hassle. Obviously, since these parking bays are unmanned the onus is on the customer to pay the fee honestly. (Installing CCTV cameras to monitor the parking bays is a very expensive solution). Some will see this in terms of a loss of manual jobs, but that is a given – many jobs are going to computers, robots and chatbots. This project is also an example of a beneficial public-private partnership (PPP). The CMC has the parking slots, the parking company has a vast experience in operating electronically-controlled car parks and the mobile service providers can empower this solution through their software. The advantages are clear – there is no need to fumble around for cash, the system is paperless and environmentally friendly and there is no need to enter into arguments with parking attendants. Everyone wins, including the customers. We hope that depending on the success of this project, other local bodies will follow suit. Obviously, they will have to analyse the cost effectiveness of the project, since not every local body generates high revenues like the CMC does. But the convenience factor certainly has to be considered. For many years, the CMC has stipulated that no commercial building should be constructed without parking facilities. The CMC and other local bodies should encourage developers to go for multi-storey car parks which can make the maximum use of limited space. Several new buildings already incorporate this feature. Drivers often encounter problems from the Police when they park at places which do not have either a P sign or No Parking sign. There are many perfectly safe unmarked parking areas in Colombo, but overzealous police officers sometimes impose fines or request motorists to leave such places. In places where parking is not expressly forbidden by the local bodies (actually, the Police have no power to decide on parking issues), motorists should be given the benefit of the doubt. In the alternative, Police should discuss with the local bodies whether putting up Parking or No Parking signs is more suitable. 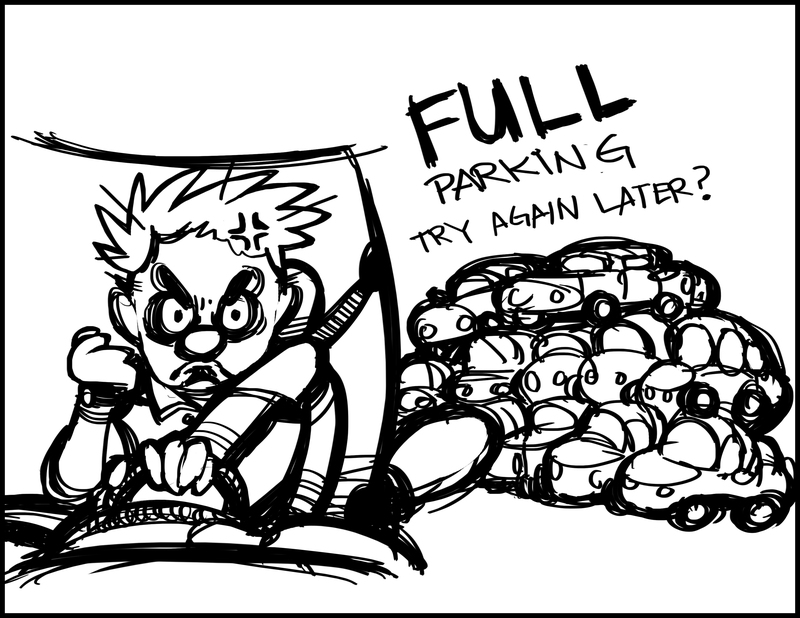 However, there is another approach – avoiding the parking hassle altogether. This can only be done if more people keep their cars at home at least on weekdays and come to work (or other business) by public transport. In fact, the lack of a comfortable, clean, punctual and efficient public transport system is one of the reasons why people opt to use their cars to get to work, enduring even a two-hour traffic jam. The Government’s new Light Rail Transit and railway electrification plans are a perfect fit that should be able to lure many motorists. In the meantime, we need to have more highly comfortable air-conditioned buses on prime routes to take people away from their cars. This has been tried a few times, but the authorities should push it more aggressively through a major marketing campaign. This will reduce both traffic and parking problems. The next step is to have a completely integrated (bus, rail, taxi) system that also takes care of the ‘last mile’ (i.e. from the roadside to the home) traffic. Looking to the future, parking may be an obsolete concept much sooner than you think. Most people already rely on ride sharing services such as Uber and Lyft which eliminates parking worries altogether. You just pay for your ride and go on your way since there is no need to worry about parking. It will become completely obsolete when autonomous and driverless cars and Vehicle to Vehicle (V2V) communications become commonplace. All you have to do is to call up a robot car and it will take you to your destination. With companies from Google to Ford involved in every aspect of driverless cars, a parking-free future could be here in under a decade. « No minister could rob, unless the Secretaries aid and assist.